The handprint initiative, designed to help families and loved ones of patients come to terms with a sudden, unexpected death, has been introduced to ICU. 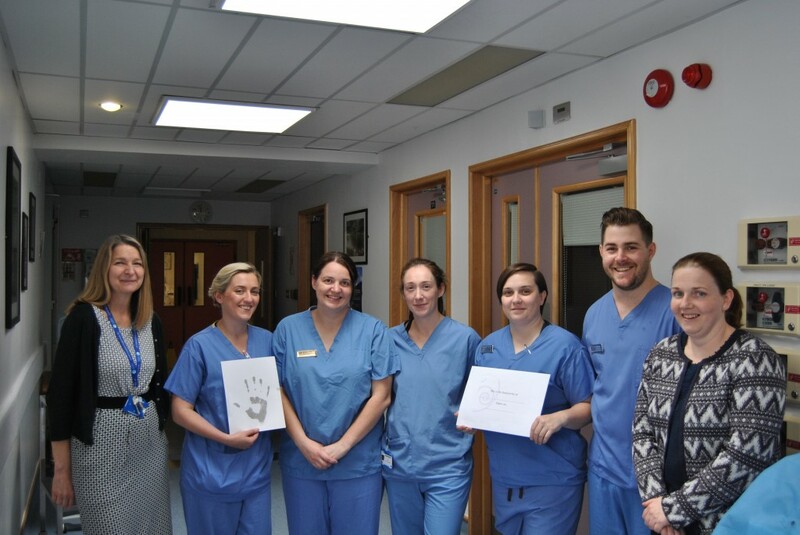 SJH Organ Donor Nurse Manager, Deirdre Coffey, identified an opportunity in the unit to support dying patients and their families to create memories and a legacy by taking handprints of dying patients for their bereaved family to keep. This practice is already in place for all patients who donate organs (taken by the National Organ Procurement Team) and is much valued by their loved ones. End of life care and preparation for a patient’s death happen within a short time frame with limited opportunity to prepare for the loss of a loved one. Consequently, patients and their families rarely get the time and opportunity to create final shared memories. The staff in ICU have found that making handprints helps families to build a bond with their loved one in their final hours. “The environment in ICU can be very high tech and intimidating at times. Taking the handprints brings everything back to a very human, deeply personal level”. The handprints are presented to the family in a special envelope with the name of the patient and the date taken. The initiative is supported through donations to St. James’s Hospital Foundation.